So 69.9% was a big setback? Yes, it was. You want to give up? Yes, you do. But do remember you are not alone. We have had, in our history of 50+ years, many, many setbacks. Imagine having your university and the whole set of your vernacular schools closed down. Imagine having all your newspapers, from the English right to the Chinese left, all shut, and merged into SPH. Imagine having your party members arrested and detained en masse, with frivolous laws and justifications. Imagine being left with NO Opposition at all, because the main one (Barisan Socialis) boycotted the entire election due to unfair treatment. I know it is hard to imagine that we see this in 2015. But now you know dictatorship knows no boundaries of space and time, nor language nor race nor country. If it can work in China, it can work here. If it can work in the 1960s, it can work now. They just employ different methods to the same ends. If the South Koreans, Taiwanese, French, etc. can all move away from dictatorship to democracy, even without social media, I don’t see why we can’t. Of course, in those places, the people suffered, and maybe we are not suffering badly enough. But the Chinese in Malaysia are doing quite well economically what (as accused by UMNO), why do they still want change? Oh, because they feel they are unfairly treated? Are you fairly treated? Are you fooled into thinking you are? 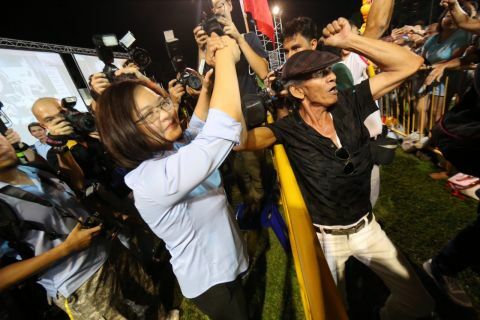 Lee Li Lian, at the results night gathering at Hougang Stadium, after suffering a defeat in Punggol East, losing to PAP’s Charles Chong, who claimed some damaging accounts about the PETC. I fear for my children. How am I going to teach them from today onwards? Today fear won, bullying won, and ugly won. Righteousness, bravery, beauty, not only lost, but suffered a resounding defeat. How am I going to teach them? That you need to be ruthless and unscrupulous in order to win? That all ideals, faiths, motivation, even hard work, carefulness and pain, do not result in success, and become just a bubble when faced with tyranny? That all hope is lost? That we need to succumb? That we need to give up, and let go? Luckily I can still teach my children not to give up, with the spirit of Hougang and Aljunied. Even Punggol East lost, gloriously. So if the people are clear on a PAP mandate, they are also clear on unwavering firmness on what is right and righteous. WP did well, considering the national swing. So did SDP. I want to teach my children to be WP and SDP when they grow up, so that they become the future of tomorrow. Never mind the 69.9%. We will know when 6.9m hits. SDP chief Chee Soon Juan, after SDP’s failed attempt at the polls. His Holland-Bukit Timah team garnered 33.4%, lower than its 2011 share of 39.9%, although it was still a respectable result considering the huge swing towards the PAP this time. Some say it will be too late. New citizens already in. Well, it is already too late, 50 years ago. And yes, we may still miss it the next GE, and the following, and the following following. But the day we give up is the day we cease to live. And I am grateful of God’s insistence in making my life exciting and with something to pursue, each time more arduous than before. If the PAP loses so quickly, I think I would lose direction in my life, dedicated to this purpose. Thank you God for testing and trying us, and bringing out the best in us, time and time again. I will continue to teach my children to be righteous, brave and beautiful. Because the day we relent is the day Satan wins. And I rather die than let Satan win.